The Incredible Hulk first met the Mighty Thor in an old issue of ‘Don’t stick it there, it may bruise my scrotum’. Within this comic book masterpiece, Hulk and Thor compared beauty tips as well as the size of their fists. What? It is true! If you don’t believe me why don’t you watch this 45 minute cartoon made in 2009. As per usual, whilst the ruler of Asgard, Odin, sleeps, the mighty Thor and the inhabitants of his kingdom protect it from monsters and trolls alike. This time though, the evil mastermind, Loki, with some help from the enchantress, Amora, transports Bruce Banner from Earth to this Godly plane, separates him from the Hulk , so that Loki can then 'use' him to beat the sh*t out of Thor with. But does this come to light? Does the Loki / Hulk hybrid, SMASH? Yep – big time – resulting in a lot of problems in the aftermath of this epic battle. You see, during this fight, Hulk initially breaks his connection with Loki and just continues to pulverize everything in his path. And secondly, once Thor is helped to recover from his injuries, he is then aided by Amora to gain his senses, only to then discover that Loki has killed Bruce Banner and sent him to hell. Now 'what next' you might wonder, huh? Correct – while Amora is told to protect Asgard from the Hulk, Thor and Loki go to hell, and try to barter with Loki’s daughter, Hella, for Bruce’s soul. However, Bruce does not know that he is in hell, he is in a dream, and is woken up from it to make an ultimate sacrifice. And that is why what next transpires is a somewhat strained and brash turn of events all in all. Where Hulk smashes - Bruce wishes - brothers wash dishes - and the fate of God-kind resides within the grasp of a human soul. 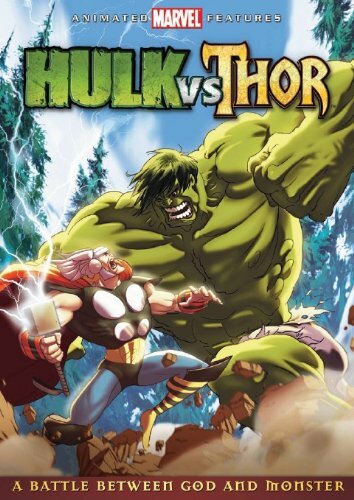 'Hulk Vs Thor' is one of two animated films that has gone straight to DVD, with the other one being 'Hulk Vs Wolverine' (click here for review). But, is it any good as a film on its own? Does it tell a story and spin a bit of entertainment value into the mix? Hmm? Yeah – I suppose it does – it tells a simple story set upon an otherworldly plane, and on top of that, it also presents to us a lot of action too. Now where the action is concerned – this I like. As it is bold in its depiction, relentless in its execution, and in someway has a manga-esque quality that I personally enjoy. 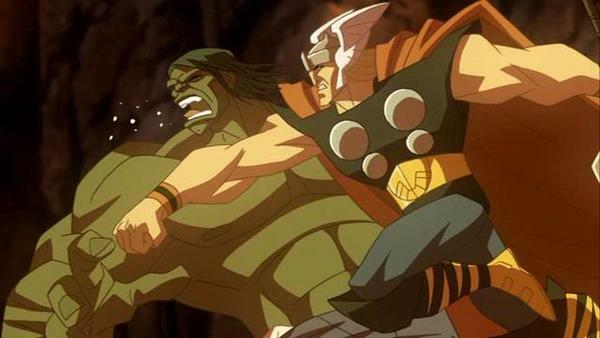 My favorite fight scene out of the numerous attacks presented throughout this film, is the one between Hulk and Thor. Well, I liked it because it does try to put on a show, and really pushes the two combatants as far as they can go – physically I mean. Also, I did not mind how this film was paced, as it did have a very nifty way in transposing the action segments to the exposition segments, almost having an incremental feel in the tension conveyed. 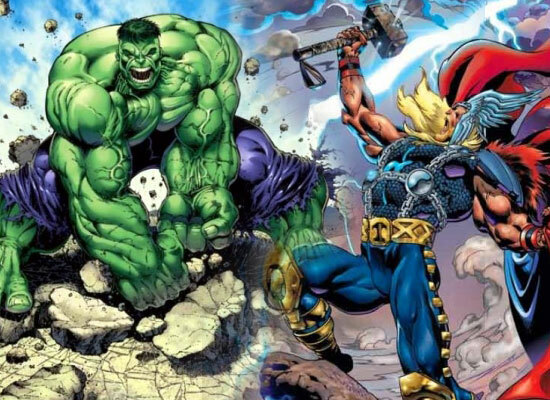 However, where ‘Hulk Vs Thor’ comes up short, is in the rest of it really. For a start, I found that the overall story was a disassociate affair. Well – come on – who gives a toss apart from certain few die hard fans about what the hell happens to Asgard? Me, personally, I would have preferred it if this story were set on Earth or something, that way there would be an associative pretext that would have connected me to the story on a more grounded level – which I am afraid to say this one didn’t. Also, in addition to all of this, I could not help but feel that the story was a little flat in places, and had a type of ‘paint it by numbers’ feel structurally. For example – Act One: Set up the premise. Act Two: Increase the level of danger. Act Three: Tie up the loose ends and put everything relatively back to normal. OK, I understand that this is just a pithy high-octane animated adventure, with two very colourful Marvel characters. Nevertheless, this is not to say that the overall premise should be made for someone with an I.Q. lower than there waste-band. Adults watch these films too, right? And as such, should be given something more than a linier storyline with an obvious ending. Anyway, enough of that, as I do not want to stray too far away from the matter at hand – this film. Overall, I found it a somewhat balanced animated piece, with some good art, action, and pace, whilst at the same time having a mediocre storyline, pretext, and core. Still, that it is not to say that it is not a good film to watch – as it is – just don’t expect something that is ‘out of this world’, or otherwise you will be gravely disappointed. So-so animated film – with a good / bad vibe running through its veins.